The role of Mary Magdalene was crucial to the Easter story. Why she stayed at the tomb when the men - Peter and John - had gone home, we will never know. Perhaps she was just so distraught with grief that she did not really know what she was doing. Many of you will be able to identify with that experience. And yet, it was in the depth of that grief that Jesus came to her and in a very intimate way called her by name. Mary wanted to rush to him, but he stopped her and instead she did as he asked and went to tell others what she now knew: that the Lord had indeed risen from the dead. How Mary must have been bursting with that good news as she rushed away from the garden! How it must have poured out of her! How it must have inspired others, bringing them to also believe and transforming their lives. The Easter good news has the power to transform our lives too. I think we have experienced that through the wonderful services we shared in during Holy Week and Easter. On Maundy Thursday, and then again on Easter Day, many of us shared in that experience in the 'renewed', or we could say 'transformed', St Nicolas'. The building has been physically renewed and we will celebrate that renewal over the first weekend of May, but the renewal campaign was also about personal renewal. I hope that for all who have been involved there will be a real sense of personal transformation; of growth in faith; in love for God and for one another. Whether or not you worship regularly at St Nicolas', everyone has a right to be proud of what has been achieved, because so many across the Parish and beyond have contributed in very many different ways. As we celebrate the renewal of the building, let our celebration also be of our shared faith. The faith which has the power to transform, to renew. The faith which is centred in the Easter Gospel; the good news that Jesus Christ is truly risen, as Mary Magdalene was the first to witness. St Nicolas' - Celebrating our Renewal! New ceiling, new windows, new flooring, new heating - after 10 months' work at St Nicolas, we're back in church, and it's time to celebrate! The early May Bank Holiday weekend is full to bursting with a massive array of events and displays in the church and hall - from the Spring Fair, to our Thanksgiving Service, to the Youth Groups' talent show. We are hoping that many people in the surrounding community will want to find out what has been going on behind the scaffolding and boarded windows. Please invite your neighbours and friends to come along and see the finished result - and join the celebrations. Here's a taste of what is in store from 3rd to 5th May. There really is something for everyone - so see you all there! Browse and buy from the toy, bric-a-brac, and book stalls; build up an appetite on the games and bouncy castle; then relax with a ploughman's lunch. Not forgetting the chance to win with our celebration raffle! To be led by the Bishop of Gloucester and attended by the Mayor of Cheltenham, together with representatives of those who have been working on the refurbishment and many other visitors. The church will then be open to visitors from 11am to 5pm, and during the afternoon cream teas will be on the menu. This service will be followed by an Organ recital at approx 7.30pm. An opportunity to shine in the limelight! The Youth Groups are promising another dose of fun and laughter with a Talent Show at St Nicolas'. This is a ticket only event - please see members of the youth groups for details - and starts with a barbecue at 1pm. Synergy and Elevate are organising the barbecue followed by the Talent Show as part of the St Nicolas' celebration weekend. There are still places for performers - whatever your talent! Tickets for the combined BBQ and Talent Show are also now available: £3 for adults, £2 concessions, see Jon Lyle, David Smith, Kirsty Walter or Andy Macauly. Places are limited! The Scheme which brings into existence the union of our two parishes as a Team Ministry will be submitted to the Privy Council for approval by Her Majesty the Queen during May. This means that (subject to her approval!) the Scheme comes into operation on 1 June 2003. What does that mean? We will become one benefice, and be known as 'The Prestbury and All Saints' Team Ministry'. Fr Stephen will become the Team Rector and Fr Michael the Team Vicar. Fr Paul is already licensed to both Prestbury and All Saints' as an Assistant Priest (House for Duty). He will be licensed to the new Team. Grant Bayliss and Peter Brown will both be licensed as Deacons to the Team Ministry when they are ordained on 29 June. Peter, as a member of the Prestbury Ministry Leadership Team, will mostly exercise his ordained ministry in Prestbury. All Saints' are currently exploring Local Ministry and it is expected that they will form their own Ministry Leadership Team made up of members of their congregation. The Scheme provides for our two parishes to remain distinct and so we shall retain our two separate PCCs. This means that in many ways people will not notice many differences, although it is hoped that we will soon discover that there are things which it is good for the two parishes to do together! Fr Paul will concentrate mainly on pastoral ministry, although his expertise will continue to be drawn upon in many different ways! We continue to be very well served by Fr John Mead and Fr Tim Raphael, both retired, who take some services and also offer pastoral care. We look forward to 'fitting' our two new Deacons into this new pattern! At some point we hope to have a special service to inaugurate the new Team Ministry - watch this space! In the meantime, please do not hesitate to ask one of the clergy or a member of the Ministry Leadership Team if you have any questions about the new Team Ministry. It has been a great pleasure to have been part of the confirmation preparation for nine young people from the Parish: James Walter; James Radburn; Rosie McGowan; Hannah Smith; Eleanor Fagan; Anna Broekman; Lucy Evans; Charlotte Underwood and Alastair Smith. Together with the rest of Elevate, we have been looking together at what the Christian faith is all about and how to put that into practice, with time to share those difficult questions. I have been struck by the importance of remembering that our faith is a journey and of keeping on that road. The support and friendship of the group as they travel together has certainly been vital. We are now looking forward to a special stage in the journey - the confirmation service. This will be on the evening of Friday 6 June at Gloucester Cathedral. Please pray for all those taking this step of confirmation as they continue ever onwards with God. On Sunday 29 June Peter will be ordained Deacon at Gloucester Cathedral. He will be an Ordained Local Minister within the context of the Prestbury and All Saints' Team Ministry - St Mary's, St Nicolas' & All Saints'. All Peter's service to the church will be entirely non-stipendiary (i.e. unpaid). We should like to provide Peter with the necessary robes - cassock, surplice, alb, etc. To do so, the four churchwardens would be most grateful to receive donations. On Maundy Thursday Her Majesty the Queen presented the Royal Maundy in Gloucester Cathedral. We are delighted that five people from our Parish have received this honour: Eileen Jones, Reg Viveash, Jim Moore and John McKenzie were nominated by the parish, and Raymund Waker by the diocese. At the well attended Parish Annual Meeting held in St Mary's Church on Sunday 6th April, Ken Bradbury and Jerry Porter were elected to be Churchwardens and Eileen Jones and Peter Attwood were elected to be Assistant Wardens with special responsibility for St Nicolas'. The new members of the Parochial Church Council are Peter Horne and Jim Mackie. The meeting recorded many thanks to those members of the Council who were ending their service and to the Treasurers, and the meeting also noted how fortunate the Parish is in having a team of such dedicated and caring clergy. The AGM was held on Friday 11 April 2003 at very short notice in readiness for the Easter festival. For the first time ever, a Church Warden, Ken Bradbury, chaired our meeting for the sixteen members who attended. Last year the charges for wedding flowers had been increased and this resulted in nearly £200 extra in our bank balance - a great help should we plan a specific festival in future. Particular thanks were expressed to Angela Schofield, who for twelve years or more had organized helpers for doing the wedding flowers. She hoped to relinquish the job next year so was giving us time to find a replacement. Similarly, Sheila Beer agreed to shadow Barbara Lyle in the preparation of the next rota and Joan Rushworth undertook to be in charge of the windowsill ladies thus relieving Lindsey McGowan, who now cheerfully organizes the other festival flowers. Eternal God and loving Father, the creative source of all things green and growing, we thank you for all that our senses tell us of your glory in the flowers and fragrances around our world. Accept at our hands, we pray, the adornment of our Parish Church here in Prestbury and our gratitude for all whose work and skills are directed towards the arrangements at St Mary's. May the colours and shapes of plants, changing as the seasons change, refresh the spirits of all who see them, so that we may pass on our way rejoicing, restored in hope and renewed in faith. Amen. March was a busy month for us in the tower. Local bands rang two quarter peals in memory of Bertha Hardman - one consisted of 1260 changes of Grandsire Triples - the other 1260 changes of Plain Bob Doubles. The full peal attempt, which was to have been rung for Bertha's 90th birthday, was successful and was dedicated to her memory. It consisted of 5024 changes of Plain and Little Bob Major and took almost three hours to ring on the afternoon of 29 March. We were pleased to ring before the service for Malcolm McKelvey on Saturday 15 March. It was encouraging to receive many remarks from people who enjoyed hearing the bells on the way to the celebration. Our tower AGM took place at 9 pm on 18 March in the tower after normal ringing practice. Fr Michael kindly chaired the meeting for us. The meeting ended at 10.30 pm. The officers listed in the Parish Directory remain unchanged. The afternoon of Saturday 22 March saw us taking part in the Association-wide Training Day. Six helpers rang with five learners throughout the afternoon. The learners were improving their ringing skills. They came from various parts of the Gloucester and Bristol Diocesan Association. It was nice to meet other ringers and to help them to become proficient. Many of our own ringers went to other towers on the Training Day - some to help and some to learn! At the time of writing, we are looking forward to ringing for Palm Sunday and Easter Sunday. This year, a bell is to be tolled during the Good Friday procession. The wedding season will soon be upon us. We hope to ring joyously for these happy occasions. There will be a Plant Sale on Saturday 17 May at 2.00pm in aid of the Renewal Appeal. We hope to have all sorts of plants on sale, and will be grateful for donations of bedding plants, herbaceous perennials and vegetable and herb plants. If you are able to supply anything, please ring me by 14 May and I will collect, or please deliver to St Nicolas' on 17 May between 10.30am and 12.30pm. This year's season starts on Wednesday 14 May with a concert of instrumental music performed by Dean Close Scholars in St Mary's church. Coffee and biscuits will be served from 10.30am and the music will start at 11 o'clock. 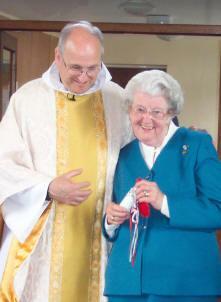 The retiring collection will be in aid of church funds. All are welcome. There will be a concert in All Saints' at 7.00pm on Saturday 7 June by the Abertillery Orpheus Male Choir. All proceeds will go to the Youth Work of the Parish. Tickets cost £7.00 and are available now from Marion Beagley, Gill Wood, Marion Godden or the Parish Office. Get yours now to avoid disappointment! St Mary's or St Nicolas' Church Choirs? St Nicolas' Choir sings at the 9.30am Sunday Morning Eucharist at St Nicolas' Church and St Mary's Choir sings at the 11am Sunday Morning Eucharist at St Mary's Church. Both Choirs sing at a monthly Choral Evensong at St Mary's. 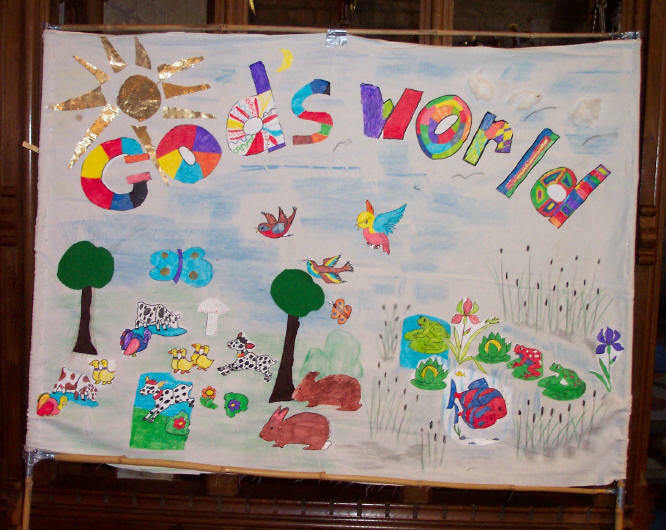 St Mary's Sunday School begins a new term on Sunday 4 May. The children meet in the Upper Room at 10.50am and rejoin their families during the Eucharist. St Nicolas' Sunday Club starts again on Sunday 11 May in the Hall at 9.20am. 4 May is Parade Sunday at St Nicolas' and all children will be in church. Enquiries about Sunday School/Club to Linda Biggs or just turn up at church. Our new term starts on Thursday 1 May in St Mary's church at 2 o'clock. If you are looking after a young child aged 0-5 years, whether your own or someone else's, do please come and join us for this very informal service. We sing songs, listen to a short Bible story (or play in the baby corner), colour a picture and have a cup of tea. For further details contact Frances Murton at rockers prestbury.net or just turn up. To cover the St Mary's and St Nicolas' ends of the Parish, many volunteers are needed to collect from house to house during Christian Aid Week, 11-17 May. If you can help with collecting, please speak to Gill Ashman or Paddy Spurgeon. Thank you. The Coffee Morning held on Tuesday 1 April in aid of The National Star College, Ullenwood, raised the sum of £432. We would like to thank everyone who made the effort to come, despite the weather, and gave so generously. The next stall will be on Sunday 18 May, for contributors with surnames N-Z.